Making sure your grass stays green while your wallet remains fat can seem almost impossible. That is unless you know a few top tips and tricks for your yard irrigation system that keeps a beautiful lawn on a budget. Here you will find just those tips for making your lawn flourish on a dime. Switch out your sprinkler heads! Replace your old nozzles with a high-efficiency nozzle instead. Designed to decrease water usage (by 30%!) and even distribute water throughout the yard. Move to drip irrigation techniques. 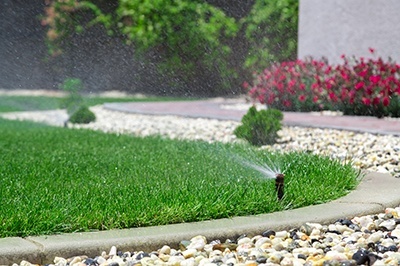 This system includes the use of micro-sprinklers and spray jets, as well as bubbler irrigation. This allows for a slow and even distribution of water, paying specific attention to the roots and minimizing runoff significantly. Make sure your system has a rain shut-off switch. This will prevent your irrigation and sprinkler system from going off while raining, wasting water. Check all valves and ensure they are in proper working order so there are no cracks or uneven threading that could spring leaks. Time your water. The best time to water your lawn is at dawn, afternoon risks burning plant-life due to the rising sun, and evening time has a chance of collecting fungus and unwanted bacteria. Go light! Deep watering techniques are not necessary. Light and frequent waterings are the way to go, rather than drenching the plant-life with liters at a time. Call in the professionals! Make sure you have your irrigation system checked by a qualified irrigation specialist at least once every three years. Following these tips can ensure you keep your lawn looking pristine and your irrigation system in check, as well as keeping those bank figures untouched. Preventative action with checking and replacing valves, monitoring for cracks, and keeping an eye on water usage can prove to save you significant time in the long run.